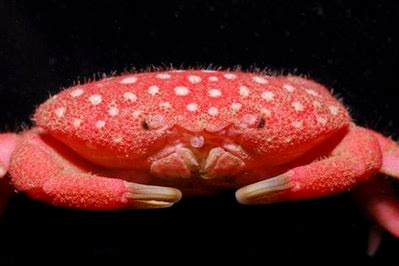 A new crab has been discovered off Taiwan's coast. This creature may be pink enough to be worthy of my daughters' adoration, it may look like a scratch-and-sniff toy, but look at that mug. Its carapace may be only an inch across, but it looks mean. I'd have a chip on my shoulder too. Tiny, pink crustaceans have a hard time getting any respect. That is one cool and interesting crab! How neat! I love how there are still new animals that have yet to be discovered. I think I would love to have this in an aquarium. Looks so cute and grouchy! It made me remember that I came across a spider once that looked a lot like a strawberry that isn't all the way ripe yet. I posted a picture of it if you want to check it out. Hehehe... Look at that face. "Whaddayoulookin'atpunk?!?" I wonder if it tastes of strawberries? I would be the taste tester!